If your client’s bathroom has been used and abused over the years, like most bathrooms, then we can help give them the bathroom remodel of their dreams. At ProSource® of Grand Rapids, we’ll give you top-quality products at low wholesale prices so that your client’s bathroom can be transformed into their own personal at-home spa and add value to their property. 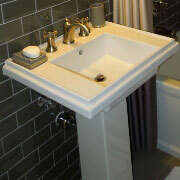 Come into our full-service showroom and leave with a new bathroom sink! We have pedestal, vessel, and wading pool sinks, along with other styles, that’ll give your client’s bathroom a much-needed facelift. 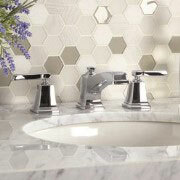 Don’t neglect bathroom faucets when shopping for a sink! Match the faucet style to the sink type or color, and you’ll have a cohesive look that will make your client want to wash their hands more and more frequently. Shower remodels allow your customer some good, clean fun in a bathroom remodel. With our different shower bases, accessories, and bathroom fixtures, your customer’s shower will be a place of relaxation, thinking, and, of course, cleaning. 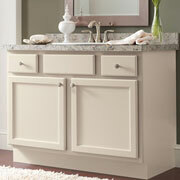 Your client’s vanity is needed when it comes to bathroom vanities! A vanity encompasses everything from storage to counter space to lighting and mirrors. Let us help them choose the vanity that’ll perfectly match their style, budget, and storage needs when you come into our showroom. Nobody likes leaky faucets and poor drains when they’re trying to relax in a tub. 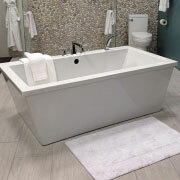 Give your client a bathtub remodel that’ll have them soaking away with our shower-tub combos, jacuzzi tubs, or statement tubs with claw feet. 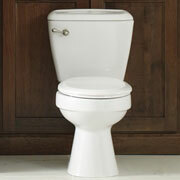 A new toilet is a must when it comes to a bathroom remodel. Your client can get better flush ratings, a good-sized bowl, and finally get rid of that wiggly flush mechanism when you work with us to find the perfect toilet for their bathroom.